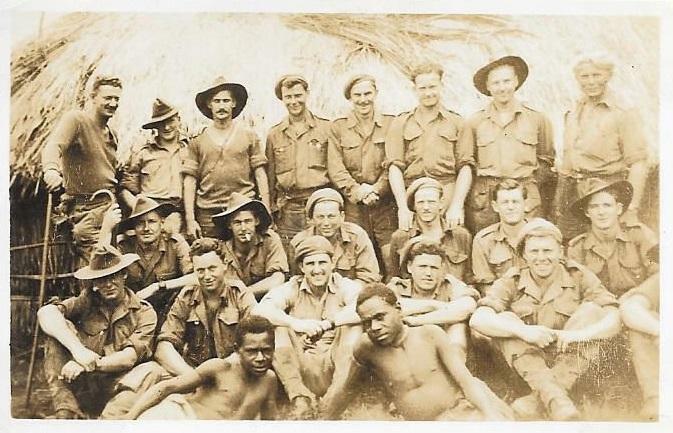 Ramu Valley New Guinea Nov 194 3to Jun 1944 C Platoon, Rear Left to Right, Max Davies, Les King, "Litch" Stanwepner, Johhny Roberts, Tommy O'Brien, "Blue" Polan, "Snowy" Went, Ted Monk. Middle Left to Right, Ron Host, Kel Cathew, George "Pancho" Humphries, "Woc" Crossing, Micky Mannix, Arthur Cullen. Front Left to Right, "Shorty" Don Stevens, Tony "Basher" Adams, Fuzzy "Winter, Otto "Blue" Bone, arm belongs to Irish O'Brien.